Class of 2017 are throwing their mortarboards up in the air at ceremony. 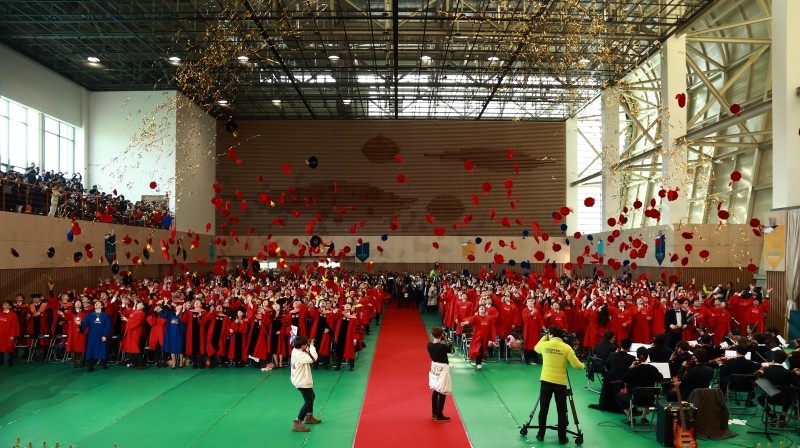 The 2017 UNIST Commencement Ceremony held in Gymnasium at midday on Tuesday, February 21. This ceremony was open to families and the general public and included representatives of all degree recipients. 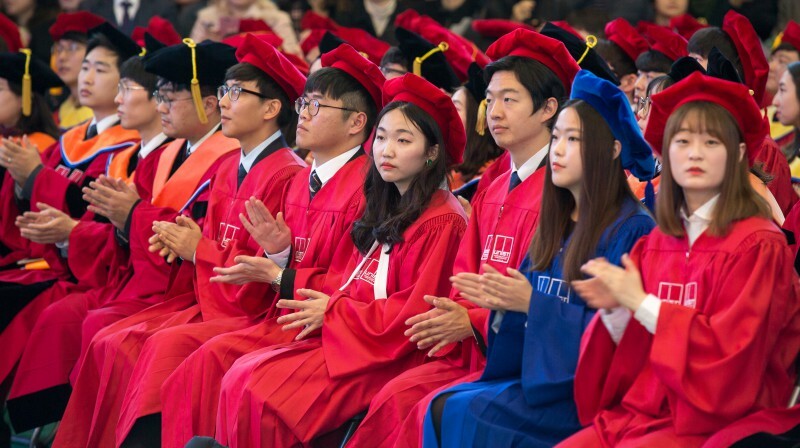 At the ceremony, President Mooyoung Jung awarded 29 honorary Doctoral, 129 Master’s, and 636 Bachelor’s degrees to students graduating after the completion of the winter semester. It turns out, since its opening in 2009, UNIST has a total of 2,511 graduates in science and technology, including 118 Doctoral, 466 Master’s, and 1,927 Bachelor’s students. President Mooyoung Jung at the 2017 Commencement Ceremony. 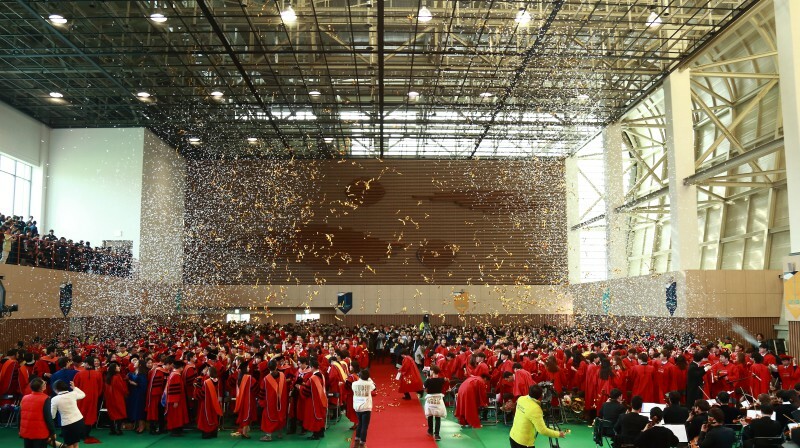 The ceremony featured the conferral of degrees, followed by the awarding of honorary degrees, greetings by University Officials and remarks by the distinguished guests, including the 2nd Vice Minister Jae-You Choi of Ministry of Science, ICT and Future Planning (MSIP), Mayor Gi-Hyeon Kim of Ulsan City, Council Chairman Si Cheol Yoon of Ulsan City Council, Superintendent Bok-Man Kim of Ulsan Metropolitan Office of Education, Chairman of Hyun-Soon Lee of the UNIST Board of Directors to celebrate this special moment of recognition. At each convocation ceremony, UNIST recognizes the exceptional achievements of outstanding students through various awards. At the ceremony, Jung Min Park of Design and Human Engineering was awarded the Minister’s Award by the Ministry of Science, ICT and Future Planning (MSIP). The UNIST Chairman of the Board’s Award went to JaeSung Yoo of Life Sciences. This is a prestigious award given annually to students selected by the UNIST administration. In addition to winning Silver in the International Genetically Engineered Machine (iGEM) competition, Mr. Yoo has been involved in various activities and campaigns that have motivated and inspired others, which includes ‘Promoting Korean History Abroad’, ‘Healing Hands’, as well as ‘Peace Expedition with U.S. Youth’. 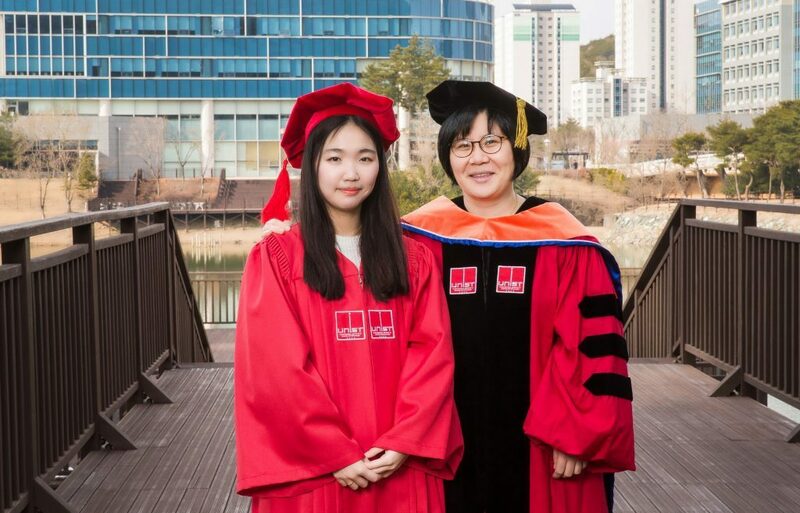 The recipient of Ulsan City Mayor’s Award, JiYeon Han (left) and Professor Mi Hee Lim (right) of Natural Science. The Ulsan City Mayor’s Award went to JiYeon Han of Natural Science. She received the award in recognition of her academic excellence in research and her extensive volunteering with local students in need of extra academic help. Ms. Han discovered her career path after completing her undergraduate internship at Professor Mi Hee Lim’s research lab where Alzheimer’s treatments are being studied. 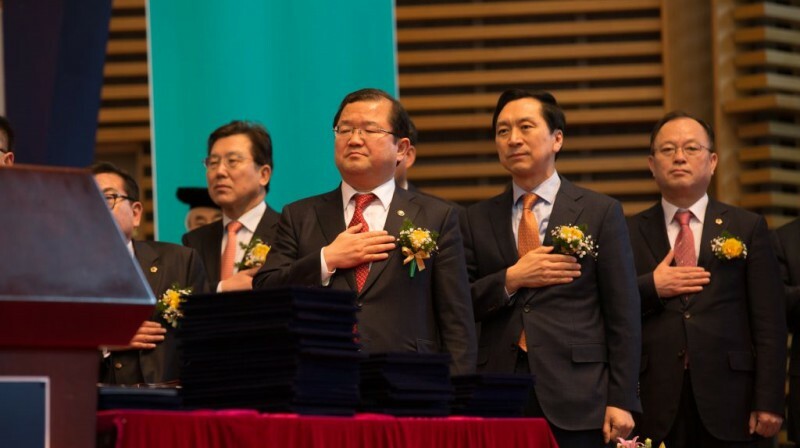 In addition, Seung-jae Oh of Energy and Chemical Engineering won Ulju-gun Governer Award, YeNa Yoo of Electrical and Computer Engineering won Kyungnam Bank President Award, and ChulJin Moon of Urban and Environmental Engineering received LS Group Presidential Prize. The Excellent Paper Award went to Han Seo of Nuclear Engineering, Min Joon Park of Energy Engineering, and Min Woo Ryu of Electrical Engineering. 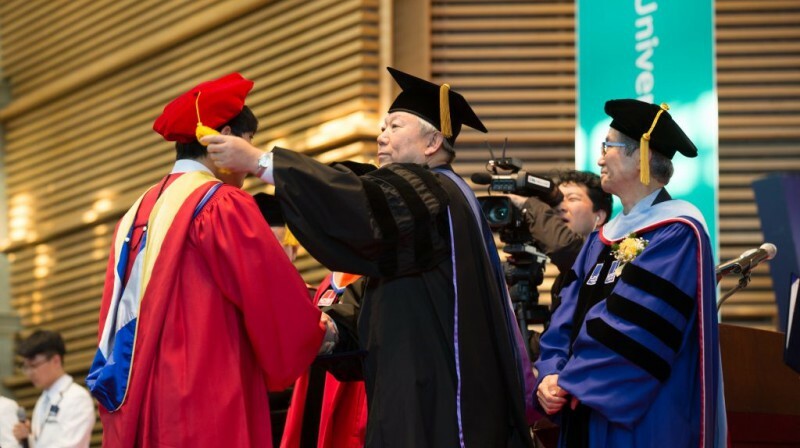 Besides, Ju Hyeon Lee of Natural Science and Hee Young Choi of Business Administration were selected as this year’s Distinguished Graduates. 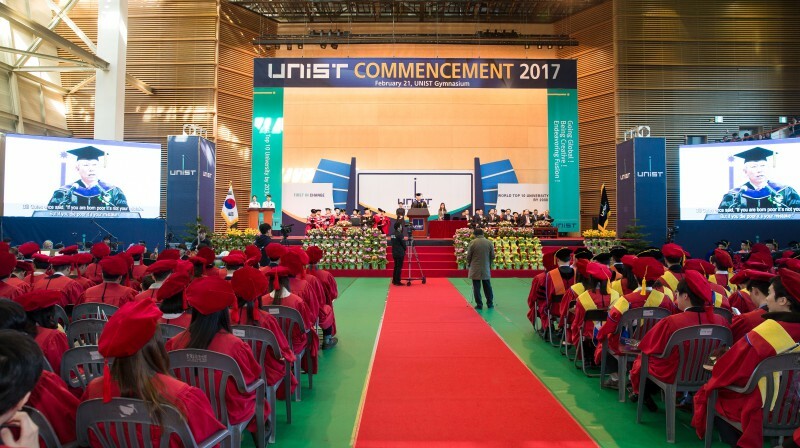 For all the UNIST graduating Class of 2017, President Mooyoung Jung said “Bear in mind that you are proud assets of UNIST”. He added, “As you begin the next chapter of your life, remember you will always have a home and family here at UNIST.